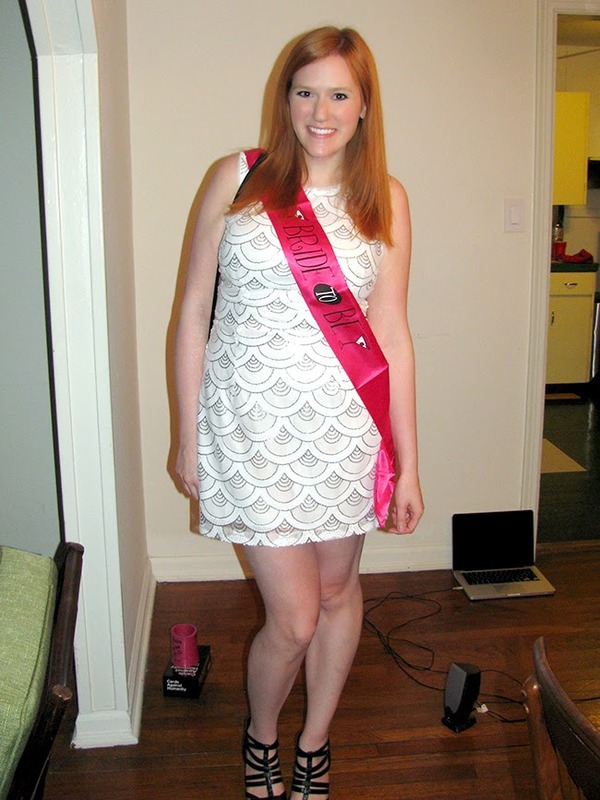 As promised, here's what I ended up wearing for my bachelorette party! Sorry for the low quality photos, it was one of those nights when we thought there was plenty of time to get ready, and then we ended up rushing to hit our dinner reservation, so I had one of my friends snap these real quick before we ran out the door. You may be noticing that I'm not wearing the dress I shared on Instagram that I was going to wear (I bought it freaking 8 months ago! It's out of stock but you can find a similar one here). I actually decided I love that dress so much that I didn't want to ruin it with a night on Bourbon Street (This one lost quite a few sequins, got spilled on, got rained on, and started turning pink!) so I decided to save it for the rehearsal dinner. Instead I picked up this sequined dress on super sale (I think it's supposed to be a prom or homecoming dress? Whatevs, it fit!) because it was still white and sparkly and fun but I knew I wouldn't care if I ruined it since it was such a good deal. It's weird, normally junior sizes do not work on me because of my bust, but this fit really well. It was a lot shorter than I'm used to these days, but heck, it was my bachelorette party! We were in NOLA from Friday through the crack of dawn on Monday and were going basically the whole time. We rented a house in Bywater which is next to the French Quarter and kind of a hipster-y neighborhood, so we spent Friday afternoon and night exploring that neighborhood and hanging out. On Saturday we ventured into French Quarter Fest during the day, which was so cool because every time you turned a corner there was another stage with a band playing and people out in the streets dancing. That night is when we got all dolled up to hit Bourbon Street, where I found some hurricanes, did some dancing (including a new dance I invented called "The Crow" which I'm told is terrifying to watch), and tried to say the weirdest things possible to all of the bachelor parties that were out. You know, normal bachelorette party stuff. On Sunday we drove over to Magazine Street to do more exploring and a little shopping and then passed out super early. I'm pretty sure New Orleans is my spirit animal, and I told Jeff we have to go back. Like, right now. Linking up with Trend Spin Linkup, Random Wednesday, Style Me Weekly. NOLA seemed like so much fun! It was great to follow along via Instagram haha. Hope you had an amazing time! You look bachelorette party perfect!! I saw a dress with a similar print at Nordstrom that I wanted to buy for my bachelorette party, but it was almost $200 which was a bit much. I went to NOLA for the first time back in December not really expecting to like it, but I was totally wrong! It has such a cool European vibe, and, as you said, the live music really makes it. I only lasted about 20 minutes on Bourbon street, but I loved Magazine street. 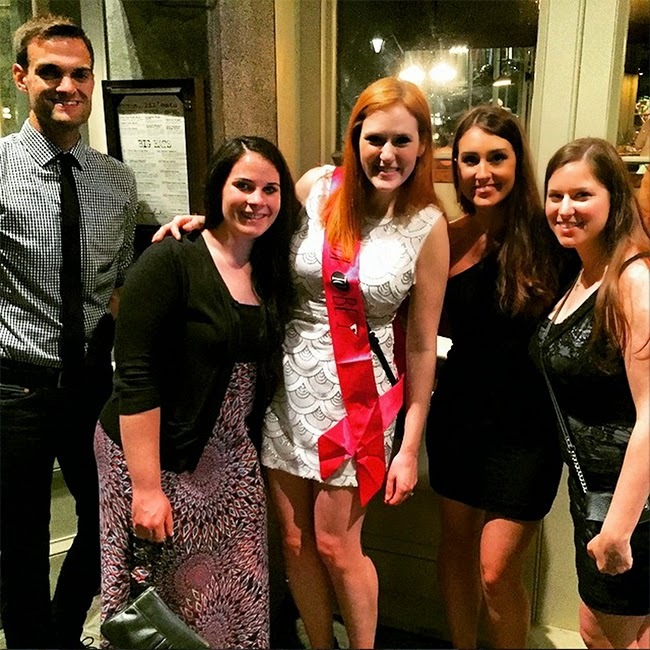 Glad you had such a great Bachelorette party! You look gorgeous in that scalloped dress, sounds like the Bachelorette party was a big success! Love this dress.. too bad it started turning pink haha! Also, I NEED the one you initially bought for your bachelorette party. Gorgeous! That is such a pretty dress!!! Sounds like you had a lot of fun! oh I love the detailing on that dress. you looked beautiful!! Yay! 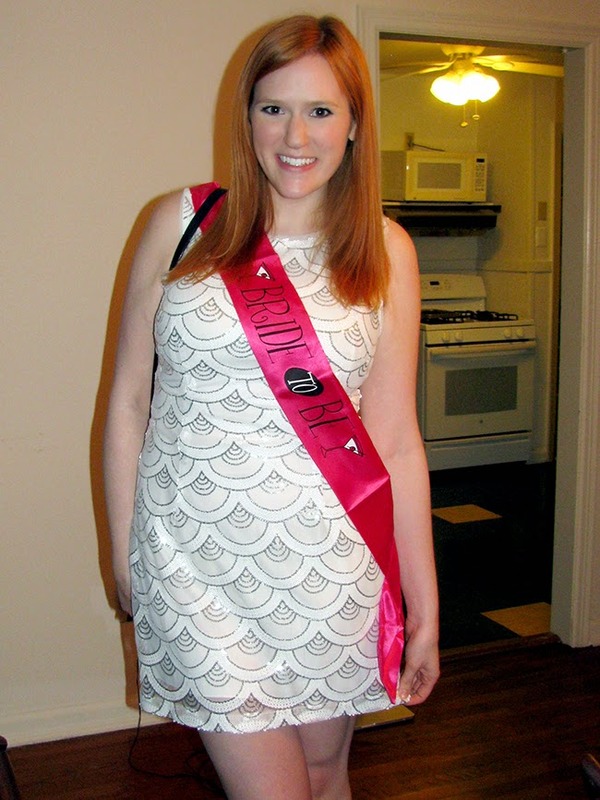 What a cute bachelorette dress! I am loving your dress! Congrats, it looks like so much fun! Right? I can't believe I've never been before!! And yeah, $200 on a bachelorette party dress is probably a bit much. Is yours coming up soon?